Once you have logged in to the Customer Portal, you will have access to documentation, software, FAQ as well as the ability to order our products. Enter your email address to restore your password. Make sure to use the same email address as used for your account. You will get an email with a link that can be used to restore your password. The download of file has started. Shipping of products on stock is normally 1-2 days after order date. Shipping of products out of stock is normally 3-5 weeks after order date depending on timing of incoming goods and manufacturer production capacity. Delivery time to customer depends on requested transportation method and destination. Delivery information should only bee seen as estimates and is not guaranteed by Techship in any case. According to specified shipment terms of the order. 1. FCA our warehouse, Gothenburg, Sweden, in accordance with Incoterms 2010. Title to and risk of loss and damage to products shall pass to Customer in accordance with these delivery terms. For avoidance of doubt any duties and export or import fees are to be paid by Customer if goods are shipped outside Sweden. 2. CPT, Carriage paid to destination, in accordance with Incoterms 2010. Title to and risk of loss and damage to products shall pass to Customer in accordance with these delivery terms. For avoidance of doubt any duties and export or import fees are to be paid by Customer if goods are shipped outside Sweden. According to quote, however this can be changed at any time according to Techship’s credit policy on Techship’s sole discretion. When paying with credit card an additional fee of 3.5% will be charged and your payment will be processed by our payment partner Bambora when the order is submitted. When paying using PayPal an additional fee of 5% will be charged and you will be redirected to PayPal when the order is submitted. Techship will provide basic product documentation, available at the customer web portal. No customizations are included in this order. Techship refers to Manufacturer’s list of Global Certifications and Approvals of the products sold, which will be provided to Customer upon request. Customer is solely responsible that the products, as well as the end product or system that the product will be installed in, have all necessary regulatory and legal approvals or certificates to be sold in a specific country. For avoidance of doubt, Techship cannot be hold responsible for any local approvals or certificates, legal or regulatory, for neither theproducts sold nor the end product or system. Technical support to Customer for the certification process is not included in the price and might be quoted separately upon request at an hourly rate. This order does not include any replacement of faulty units, other than warranty related. Techship doesn’t give any product warranty other than passing on to Customer the warranty, given from Manufacturer. Techship shall have no obligation for breach of warranty if the alleged defect or non-conformance is found to have occurred as a result of environmental or stress testing, misuse, neglect, improper installation, accident or as a result of improper repair, alteration, modification, storage, transportation or improper handling. Notwithstanding anything to the contrary contained in these Terms and Conditions and any Contract, in no event shall either party be liable to the other party for loss of production, loss of profit, loss of use, loss of business or market share, loss of data, revenue or any other economic loss, whether direct or indirect, or for any special, indirect, incidental or consequential damages, whether or not the possibility of such damages could have been reasonably foreseen and whether as a result of breach of contract, warranty or tort. No action, regardless of form, arising out of any alleged breach of contract or obligations under these Terms and conditions or any Contract may be brought by either party more than one (1) year after the cause of action has occurred. Notwithstanding anything to the contrary contained in this Terms and conditions or any Contract, in no event shall either party’s liability to the other party for damages exceed an aggregate amount corresponding to the amounts paid by Customer hereunder during the 12 months immediately preceding the relevant claim. A party suffering loss or damages shall take all reasonable measures to limit such loss or damage. Customer is granted a non-exclusive, non-transferable, paid-up, worldwide license to use, reproduce and distribute potential Software and Product Documentation solely in connection with the sale, distribution and support of the Products integrated in Customer’s products in accordance with these Terms and conditions. For the avoidance of doubt, the Software and Documentation may not be distributed separately from the Products. Customer shall not be entitled to add or remove any trade mark, trade name, copyright notices, warning legends or other markings to or from the Software or Documentation, without the prior written approval from Manufacturer or Techship in each specific case. Further, Customer shall not be entitled to modify, decompile, reverse engineer, translate, adapt, arrange or error correct or make any other alteration of the Software or Documentation, or to create derivative work using the Software or Documentation. Notwithstanding anything in these Terms and conditions and any Contract to the contrary, it is understood that neither Customer receive any title or ownership rights to the Software or Documentation, nor any other intellectual property rights. The obligations of (Software License), shall survive indefinitely. Upon receipt of a purchase order duly issued in accordance with these Terms and conditions, Techship will within three (3) Business Days notify Customer of its acceptance or rejection (together with a reasonable explanation for any such rejection) of such purchase order. Techship reserves the right to request any additional information that it deems necessary both before and after acceptance of a purchase order. Should Techship for some reason reject such purchase order, any received advanced payment will be returned to Customer. Manufacturer may at any time, at its sole discretion and expense, make changes to the Products in form, fit or function, provided that Customer is notified of any such changes at least 30 (thirty) days in advance and provided that the functionality is equal or better compared to the Specification. If Manufacturer discontinues its production and sale of the Products Techship can at any time at its sole discretion and without liability to Customer discontinue supply of the Products. Techship shall use reasonable efforts to notify Customer thereof with three (3) months’ notice. Customer shall be responsible for all taxes, customs and other duties or charges which may be levied or assessed in connection with this order. If in accordance with present or future applicable laws or regulations, Techship shall be obliged to pay, or Customer obliged to deduct from any payment to Techship, any amount with respect to any taxes, customs or any other duties or charges for which Customer is responsible as stated above, Customer shall increase the payment to Techship by an amount to cover such payment by Techship or deduction by Customer. Techship shall use its reasonable efforts to adhere to the agreed delivery dates. If Techship at any time has reason to believe that any delivery of Products will be delayed, Techship shall notify Customer in writing and state the estimated period of delay. Circumstances outside of Techship’s control, including but not limited to circumstances which are attributable to Customer or any third party, shall entitle Techship to postpone any of its undertakings to such extent as is reasonable having regard to all circumstances. All transportation costs and risk of loss incurred with respect to the repair and/or replacement of defective deliverables shall be borne by Customer when returned to Techship. Customer undertakes to comply with Techship’s instructions concerning disposal of defective Products. Customer are responsible for obtaining any export approvals, or similar, from the relevant authorities which may be required for export of the Products or Systems which the Products are installed in. The parties shall be excused from the performance or punctual performance of any of its obligations under these Terms and conditions and any Contract and such obligations shall be extended by a period reasonable under the circumstances if the performance thereof is prevented or delayed by industrial (including labor) disputes or any cause beyond the affected party's reasonable control which, without in any way limiting the generality of the foregoing, shall include acts of God, natural disasters, fire, explosions, riots, wars (whether declared or not), hostilities, revolutions, civil disturbance, accidents, embargo or requisition, shortage of material, terrorist acts, sabotage, nuclear incidents, epidemics, strikes or delays in the performance of its subcontractors caused by any such circumstances (Force Majeure). The warranties given in these Terms and Conditions constitute the only warranties and obligations made by Manufacturer or Techship with respect to the products or any other part thereof and are in lieu of all other warranties of merchantability and fitness for a particular purpose and the remedies stipulated in these Terms and Conditions are the sole and exclusive remedies. None of the parties shall advertise or publish any information related to this order without the prior written approval of the Customer or Techship, as applicable. These Terms and Conditions and any Contract shall be governed by and construed in accordance with the laws of Sweden (except for its conflict of law rules). All disputes, differences or questions between the parties with respect to any matter arising out of or relating to these Terms and Conditions and any Contract shall be finally settled under the Rules of Arbitration of the International Chamber of Commerce, in Stockholm, Sweden, by three (3) arbitrators appointed in accordance with the said Rules and the proceedings shall be conducted in the English language. All awards may if necessary be enforced by any court having jurisdiction in the same manner as a judgment in such court. The parties undertake and agree that all arbitral proceedings, shall be kept strictly confidential, and all information, documentation, materials in whatever form disclosed in the course of such arbitral proceeding shall be used solely for the purpose of those proceedings. Personal data means all types of information that may, directly or indirectly, be associated with a living individual. This data can be collected if you are in contact with us either through meetings with Techship personnel; filing of a customer registration request at our web site; registration for email or SMS newsletters; downloading of documents at our web site; ordering of Techship products and services or; through publicly available information. Techship doesn’t purchase any registers including personal data from any external source. Carrying out Techship’s obligations under a customer - supplier relationship. Securing compliance with legal obligations under a contractual relationship between Techship and a business partner. Maintaining an effective communication and relationship with a business partner or customer prospect such as registering information in our CRM-system (Customer Relationship Management). Answering customer requests, ie support tickets, regarding Techship’s products and services. Analyzing sales data in order to improve user and customer experience of Techship’s products and services. Marketing, customer surveys and general market communication. Creation of user accounts and reset of user passwords for these accounts. Analyzing the usage of Techship’s web services and the traffic on Techship’s web site. Techship will not disclose Personal Data to third parties unless it is required to fulfil the purposes listed above. Transfer of Personal Data will only be made to such countries that offer an adequate level of data protection, as decided by the EU Commission, or if the supplier has a legally binding and enforceable instrument that guarantees the safety of the Personal Data. When you access our web site, your web browser is technically set up to automatically transmit the following data to our web servers, which we then capture in log files: date and time of access; URL of the referring web site; files retrieved; data volume transmitted; browser type and version; operating system; hardware used; IP address and domain name of your internet access provider. You can configure your browser not to transmit this data to us, but in this case Techship cannot guarantee full web site functionality and there is a risk of poor user experience. This automatic information transfer when browsing our web site is exclusively information which doesn’t allow you to be identified. This information is necessary for technical purposes in order to correctly deliver the content requested by you. The log data is analyzed only for statistical purposes in order to improve our web site and its functionality. Withdraw your consent to Personal Data processing. You may at any time, by contacting Techship at email info@techship.com or telephone +46 31 7303200 get a copy of, or restrict, the processing of your Personal Data. Please note that if you request a limitation of Personal Data processing or deletion of your Personal Data, we might not be able to provide our products or services to you. We have taken the appropriate technical and organizational measures to protect Personal Data against loss, miss-use, unauthorized access, disclosure, alteration or destruction in line with applicable laws on data protection and data security. To safeguard that Personal Data is treated in a safe and confidential way we use Transport Layer Security (TLS) encryption verified by GoDaddy.com, Inc. Furthermore, our personnel have signed non-disclosure agreements and are obliged to follow Techship’s rules for data and IT-security and other internal rules and policies which regulate the processing of Personal Data. Techship store Personal Data only as long as it is necessary in order to fulfil the purposes for which it was collected. Please note that Techship can be under a legal or contractual obligation to retain the Personal Data which might require us to keep the data for longer periods. You can configure your browser to block cookies, but in this case Techship cannot guarantee full web site functionality and there is a risk of poor user experience. The anonymous information generated by our cookies about your use of this website (including your IP address) is used to process statistical reports on website activity for techship.com only. We use these reports to evaluate aggregate visitor usage so that we can optimize the content to better meet your needs. We will not link, or seek to link, an IP address with the identity of a computer user. In fact, we will not associate any data gathered from this site with any personally identifiable information from any source. In the process of analyzing visitor behaviour we might use tools from third party providers such as Google Analytics. In this case Google will not associate your IP address with any other data held by Google. This is a Non-Disclosure and Confidentiality Agreement (the “Agreement”) between Techship AB (“Techship”) and you (“Company”). Company and Techship are collectively referred to herein as the “Parties” and individually may be referred to as a “Party”. By checking the “accept” checkbox in the Techship customer registration page and submitting the form you agree to be bound by the terms and conditions of this Agreement. If you do not agree to be bound by such terms and condition you should cancel your Techship customer registration. Techship and Company each desire to establish and set forth their individual obligations with respect to protecting and preserving the other's Confidential Information. “Confidential Information” shall mean any technical or commercial information, including, but without limitation, specifications, drawings, designs, computer software, hardware, know-how and all information disclosed between the Parties which is in tangible or visible form. If a party discloses proprietary or confidential information visually, orally or in any other manner incapable of physical marking to the other party, Discloser shall inform Recipient that such information is proprietary and confidential at the time of the disclosure, shall reduce the proprietary or confidential information to writing and mark it as such, and send the writing to Recipient within thirty (30) days of the disclosure. is required to be disclosed by law, judicial action, the rules or regulations of a recognized stock exchange or listing authority, government department or agency or other regulatory authority, in which event Recipient shall take all reasonable steps to consult and take into account the reasonable requirements of Discloser in relation to such disclosure. If Recipient receives a request or demand to disclose all or any part of Confidential Information under the terms of a subpoena or order issued by a court of competent jurisdiction or authorized governmental agency, Recipient may comply with such request or demand only if Recipient: (i) asserts the privileged and confidential nature of Confidential Information against the third party seeking disclosure; (ii) promptly notifies Discloser in writing of any such requirement or order to disclose prior to the disclosure of Confidential Information; and (iii) upon Discloser’s request, reasonably cooperates with Discloser to protect against any such disclosure and/or obtain a protective order narrowing the scope of such disclosure and/or use of Confidential Information. “Persons” who have a need to know, as used in this Agreement, mean and include persons who are employed by or are directors of: (i) Recipient; (ii) Recipient’s ultimate parent company; or (iii) Affiliates that are under the control of Recipient’s ultimate parent company (meaning those entities for which Recipient or its ultimate parent company has fifty percent (50%) or more of the votes in such entity or is able to direct its affairs and/or to control the composition of its board of directors or equivalent body). Recipient shall notify all such Persons of the existence of this Agreement and the obligations of confidential treatment at the time the Confidential Information is disclosed to them. If it should be necessary for Recipient to supply the Confidential Information to third parties for purposes relating to the Identified Purpose, Recipient shall ensure that the provisions of this Agreement are properly observed by the third party. No transfer of Confidential Information shall take place to a third party without the prior written consent of the Parties to this Agreement. Recipient hereby acknowledges that unauthorized disclosure or use of Confidential Information of Discloser could cause irreparable harm and significant injury to Discloser that might be difficult or impossible to quantify. Accordingly, Discloser may seek immediate injunctive relief from breaches of the provisions contained in this Agreement in addition to any other rights and remedies it may have. Each Party will be responsible for making its own decision on the Confidential Information and each party acknowledges that the other party is not making or giving any representation, warranty or undertaking, express or implied, as to the accuracy, completeness or reasonableness of, and will not have any liability for the use by any other party of the Confidential Information. Accordingly, neither party shall be liable for any direct, indirect or consequential loss or damage suffered by any other Party or any person as a result of relying on any statement contained in or omitted from the Confidential Information. No right or license of use is granted to Recipient in relation to the Confidential Information disclosed pursuant to this Agreement, and no license shall be deemed to have arisen or be implied by way of estoppel or otherwise. Nothing in this Agreement shall be construed as granting or conferring any rights in title to or license in respect of any Confidential Information. All Confidential Information shall remain at all times the property of Discloser. Nothing contained in this Agreement shall be construed as creating any obligation or any expectation on the part of any Party to enter into a business relationship with each other, or as creating any partnership or any other legal entity between the Parties. No public statements shall be made concerning the Parties’ discussions or their objects without the express written consent of both Parties, and the text of any public statement shall be concurred in advance between the Parties. This Agreement will terminate the earlier of (a) by either Party upon ten (10) days’ prior written notice to the other Party, or (b) five (5) years from the Effective Date, subject to renewal by a mutual signed writing of the Parties. Recipient’s duty to protect Confidential Information pursuant to this Agreement expires five (5) years after the date of first disclosure of the Confidential Information. Upon Discloser’s written request, Recipient shall destroy and provide written certification to Discloser of such destruction, or return to Discloser, all Confidential Information, including without limitation all documents, memoranda, notes, and other tangible embodiments prepared by Recipient based on or which include Discloser’s Confidential Information. If any provision of this Agreement is found by a proper authority to be unenforceable or invalid, such unenforceability or invalidity shall not affect the other provisions of this Agreement and the unenforceable or invalid provision shall be construed to be amended in order to avoid such unenforceablility or invalidity while preserving as closely as possible the intent of the Parties. None of the Parties may assign nor otherwise transfer part or all of this Agreement or the rights and obligations thereof to any third party without the prior written consent of all other Parties. Notwithstanding any other provision of this Agreement, neither Party shall export or re-export any technical Confidential Information acquired under this Agreement or any commodities using such Confidential Information to any country to which the Swedish government forbids export or, at the time of export, requires an export license or approval, without first obtaining such license or approval. These export requirements shall survive any expiration or termination of this Agreement. This Agreement shall be governed by and construed in accordance with the laws of Sweden, which shall be deemed to be the proper law of this Agreement. The Parties hereby irrevocably attorn to the exclusive jurisdiction of the courts of Gothenburg, Sweden for any legal proceedings arising out of this Agreement or the performance of the obligations hereunder. This Agreement sets forth the entire understanding and agreement of the Parties with respect to the subject matter hereof and supersedes all other oral or written representations and understandings. This Agreement may be amended or modified only in writing. Are you sure you want to subscribe to updates for jjPlus JWX6058 Half mPCIe? We are carrying wireless components in different category segments. Our product portfolio consists of leading brands to serve all possible customer needs. We offer a wide range of customized services, providing our expertise and technical resources, aiming for the best customer solutions. We want our customers to experience a high service level in all contacts with us. Giving state of the art-support is a big part of our DNA. Techship is a global supplier of wireless components for the embedded industry. Our goal is to provide our customers with the best products combined with outstanding services and support. Use the form below to restore your password. The new password must be at least 8 characters long. 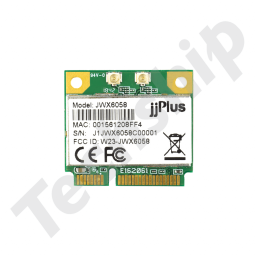 JWX6058 support 802.11ac Wave 2 as well as abgn, MIMO 2X2 and BT4.2. This MiniPCI-e module has the QCA6174A-5 chipset from Qualcom Atheros. Do you need offline data on this product? Subscribe to stay up to date with the latest about this product.